Later today I will be travelling with my community to Roehampton, to celebrate the feast of the Sacred Heart. The Janet Stuart centenary events happening during these two weeks mean that we will celebrate in company with our General Council and lots of RSCJ, colleagues and alumnae from all over the world. The world will indeed be gathered and contained in the Heart of God. It promises to be quite a feast! So, donning my province webweaver's hat I asked my sisters if they could share what they would be celebrating today. As you can see (here), though we've said it in different ways, and touched on the large gathering, really, there is one central theme, one common denominator: LOVE. 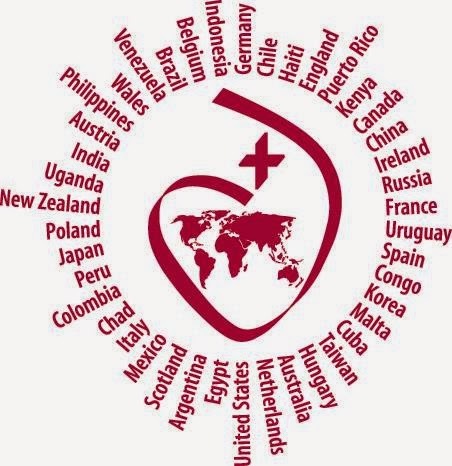 Today, on the Feast of the Sacred Heart, whether in Roehampton with huge crowds or in a small community elsewhere, we will be celebrating love: that tiny, four-letter, single syllable word which carries within it the power to change lives and indeed the course of history. Primarily we will be celebrating the love of God: as today's second reading reminds us this is the love I mean: not our love for God, but God's love for us... (I John 4: 10) This is a love which is fundamental and over-arching, infinite and all-embracing, steadfast and changeless, yet experienced anew time and again in different ways: tender and healing when we need gentleness and restoration, passionate and abundant when we need to be called forth into something bigger than ourselves. Because, faced with such love, there can only be one response - more love: since God has loved us so much, we too should love one another (I John 4: 11). And this is the response which lies at the heart of the call to and mission of the Society of the Sacred Heart - sharing and making known this love, whose source is in the Open Heart of Jesus. Not always easy, or indeed easily achieved, but always worth it. And it is to this mission of proclaiming God's love with our lives that we will all re-commit ourselves during Mass. This re-commitment is done in union with RSCJ throughout the world. It's a powerful act, and one that strengthens our Cor Unum - our congregational sense of being one heart. It's a love and fidelity towards each other which always brings us back to the source, to the love which lies at the heart of the Society, because our full motto is Cor Unum et Anima Una in Corde Jesu - one heart and one soul in the Heart of Jesus.